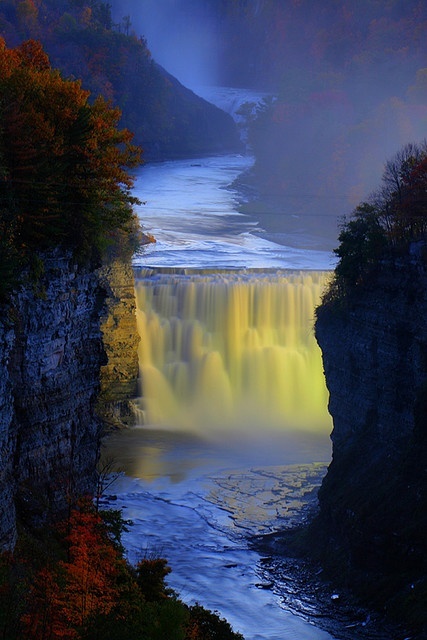 The Genesee River is an American river flowing northward through the Twin Tiers of Pennsylvania and New York. The river provided the original power for the Rochester area's 19th century mills and still provides hydroelectric power for downtown Rochester. The Genesee is the remaining western branch of a preglacial system, with rock layers tilted an average of 40 feet (12 m) per mile. It begins in the Allegheny Plateau conglomerate, sandstone, and shale rocks of the Mississippian and Pennsylvanian subperiods. The river also often exposes older rocks such as shales (some rich in hydrocarbons), siltstones and some limestones of the Devonian period at Letchworth and, at a canyon with three more Niagara Escarpment waterfalls at Rochester, limestones and shales of Silurian age.